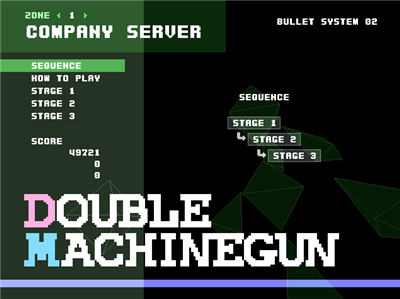 BS Double Machinegun (13.9mb ver0.8 made 02/03/2014, no install .zip) is a small Japanese arcade shooter with a difference. You control 2 automatic guns simultaneously. The guns fire automatically and you control aiming only. You really need to be ambidextrous and having 2 sets of eyes would also help. You need to destroy all objects, both moving and stationary that come into view scrolling down from the top of the grid. 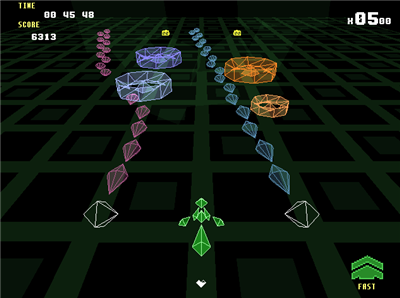 There are 4 Zones each containing 3 short levels, total 12 levels, plus a Sequence mode to play all 3 levels of each Zone together, although there is no difference between Sequence mode or playing each of the 3 levels separately. You do have a speed button for fast and slow acceleration and with practice you can use that button as well. A very good, solid shooting game with unique graphics, retro music, sound effects and fluid gameplay but I was left wanting to play more levels. 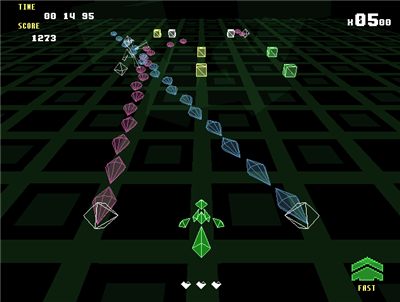 There is a way to beat most levels quite easily, but that's for you to work out. This freeware game should play on most Windows systems.